Small Town USA Brings Rest, Relaxation and Great Lake Fun! The Hoff House sits just off the square in Stockton, Missouri 30 minutes from Bolivar (great antique shopping) 1 hour north of Springfield, Missouri (and Bass Pro Shop), 1.5 hours from Branson (Silver Dollar City and shows) and 2.5 hours south of Kansas City. The home sits just minutes from one of the top 10 sailing lakes in the country, Stockton Lake. Swimming, fishing, and boating of all kinds are also enjoyed there. 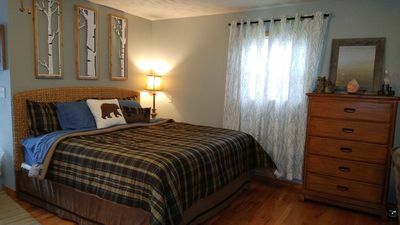 The home is within walking distance from restaurants, banks/ATM's, coffee/gift shop, pharmacy, and a health food store. The Hoff House is the perfect place to return for a BBQ, a game of horseshoes and drinks on the porch after a long day at the lake. It is spacious inside and out. 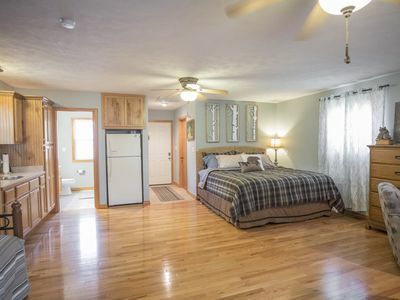 There is ample room on the 2 acres surrounding the home for parking and play. The kitchen, dining room and living room are open so that the cook in the kitchen can be a part of all the activities. There is a 10 person harvest table in the dining room. There is 1 queen bedroom, 1 king bedroom, and 1 full bath downstairs. Upstairs, there is 1 queen bedroom, 1 bedroom with 1 double bed with 2 twins, 1 king daybed bedroom and another double bedroom upstairs with 2 more full baths. The large masterbath is upstairs and includes 2 pedastal sinks, a jetted hot tub, private toilet and shower. There is also a separate sitting area upstairs. 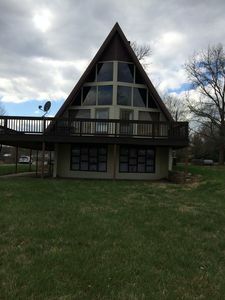 There is an upper deck, a porch (great for coffee in the morning) and another deck with picnic table on the backside of the home overlooking a large grassy area. It's a wonderful place to sit and relax with friends and family. Because of the spaciousness of the home the Hoff House has become a favorite destination for reunions, anniversaries, retreats, and annual family events. 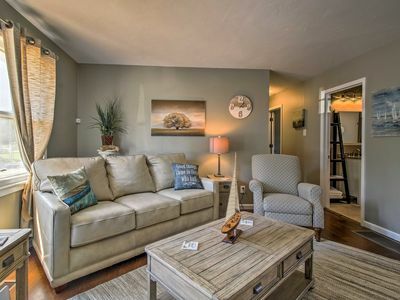 It's close proximity to the lake offers fisherman and boaters a home away from home. 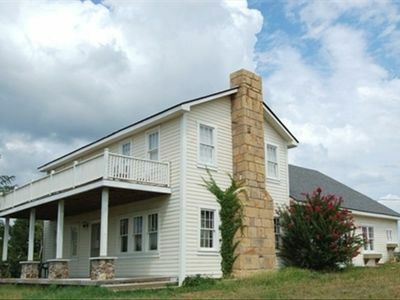 The Hoff House is a historical Civil War era home totally remodeled in 2003. Many of the original attributes of the home have been maintained in the remodel. The original staircase and parts of the wood pinned framing are still integral parts of the home. The harvest table for 10 was built using wood from the original home. Wood from the original home was also used create ceiling beams giving the home a warm, inviting feel. The Hoff House and the place that it resides offers a reminder of a time when things didn't move so fast and family and friends and the laughter that they bring were the entertainment. For more pictures of the home go to our website. 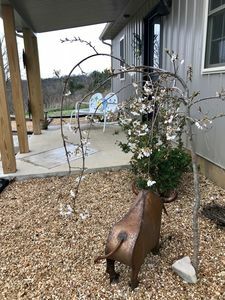 “The Dogwood”. 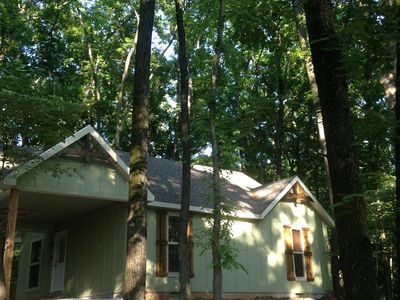 New Cottage, 1/4 mi from lake & park with launch. “The Chinkapin”. 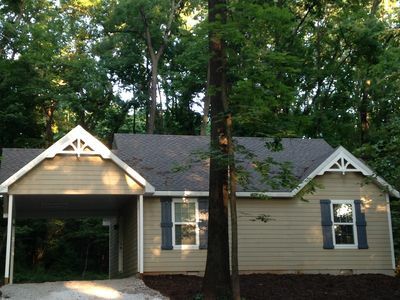 Newly built cottage, 1/4 mile from park and boat launch. 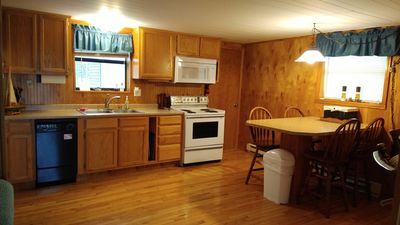 A cozy "home away from home" just two miles from Stockton Lake. Nikko’s Nook, Stockton Lake Getaway! Near the water, Community Dock & Boat Ramp!